Born in NYC and bred in Florida, Tiffany uses her exposure to different cultures and music, including her own Jamaican background to bring a unique sound and flavor to Vibe Ride. 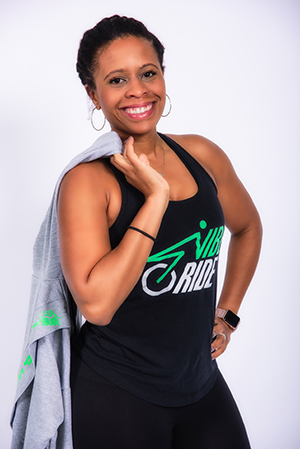 Because Tiffany has always had a passion to help inspire others in their personal life and fitness journeys, she decided to become a Co-Owner of Vibe Ride. By day, Tiffany is an estate planning attorney, active community volunteer, and lover of travel and good wine. Tiffany’s class is about letting the beat and rhythm push you further than you ever thought possible and owning your own strength- on and off the bike. She is often caught saying “you are stronger than this bike.” Tiffany’s class is a mix of form, flair and fun!